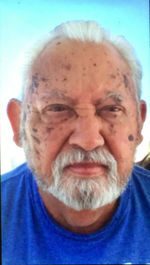 Mario Pablo Guilez 71, passed away March 25th, 2019 surrounded by family. Mario was an Army Veteran who served in the Vietnam War. He worked for the Inn Of The Mountain Gods for over 30 years. He was a loving father, grandfather, brother, uncle, husband to his late wife Delores Guilez, and a great friend to many. Mario is survived by his son Michael Guilez, daughter Crystal Guilez, 3 grandchildren: Payton Kazhe, Leyanna Guilez, Ty Guilez and his sister Sophie Peso and Father In Law Nordaine Oliver and many nieces and nephews. He is preceded in death by his parents Carlos and Genoveva Guilez, his wife Delores Guilez, his brothers Patricio “Pate” Guilez, Carlos Jr. Guilez, Mark Guilez, and niece Genevieve Guilez. Pallbearers are Micheal Guilez, Payton Kazhe, Reyes Herrera, Tristan Peso, Gilbert Guilez, and Kevin Gililland. Honorary Pallbearers are Nordaine Oliver, Ty Guilez, Tony Montoya, Raymond Montoya, and Leyanna Guilez. Visitation will be held at 9 am, Saturday, March 30, 2019 at St Francis De Paula Church in Tularosa, New Mexico with Rosary to follow at 9:30 am. Funeral Liturgy to be held at 10 am, Saturday, March 30, 2019 at St Francis De Paula Church in Tularosa, New Mexico with burial to follow in Tularosa, New Mexico. To send flowers to the family of Mario Pablo Guilez, please visit our Heartfelt Sympathies Store.